Hello! It's time another Sparkle Creations Rubber Stamps Challenge! Thanks to all of you who played along last week! Each week we will post an all new challenge at this time (9 PM PST on Mondays). For all the details, please visit the SCRS blog. Since this Wednesday is the official start to the fall season, the challenge is to create anything inspired by fall. Whether it is the change of colors, cooler weather, Halloween or something else, we welcome you to join us this week! I used Broomstick Lucy for my card today and paired with some paper from Cosmo Cricket Matilda. I colored Lucy with Copic markers. My layout is TESC128. I added some ribbon, black rhinestones and stitching to finish my card. 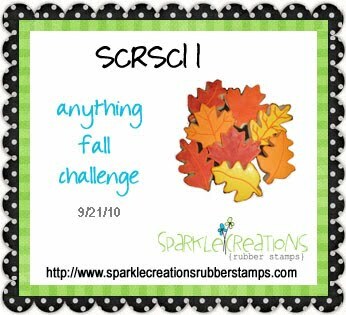 For more inspiration, please visit the SCRS blog to see the design team's wonderful creations or their individual blogs: Laurel, Lisa, Mary, Simonne, Sparkle and Risa, our wonderful September guest designer! Accessories: Scalloped Scallop border punch (EK Success), Grosgrain ribbon, 4 mm black rhinestones (Pizzazz Aplenty), Bow Easy, Foam tape, Thread, Sewing machine. This is adorable, love the paper! Your card is super adorable! I love your DP, lovely Lucy and your sentiment....too cute! 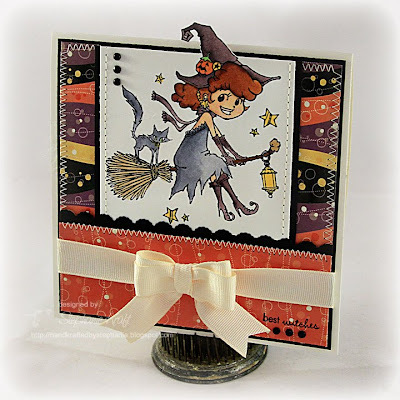 What a cute lil' witch Stephanie! You did a great job coloring all the detail! What a sweet image and your design is beautiful! the image is cute and i like how it goes over the edge of the card.